I have had another good day, and while texting with a friend tonight I came up with a new idea, experiment maybe?!?!?! Ok...so right now I am trying to find some new people to participate, I'm taking applications. This is the deal. 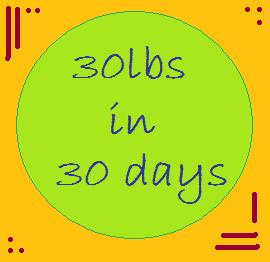 Its an attempt to lose 30 pounds in 30 days. There are a few rules. No liquid diets, no starvation, just good old fashion diet and exercise. You can follow any diet plan you would like, Zone, Weight Watchers...I would like people to follow a few different plans so that we could test out one against the other. Its another attempt to test good old willpower. I already have 2 people that want to play along and would love to get about 10 people total. If you would like to play and be feature on the blog this is what you need to do. 1. Have at least 30 pounds to lose. 2. Be willing to send me your true weight. 3. I would like a before/after picture. 4. You can play anonymously if you would like and Ill just give you a fake name, and post your numbers. So if you would like to play send me an email at fatgirltothin@gmail.com. This will start next week or when I get 10 people to participate. Which ever comes first. Hope you enjoy following along on what will be "our" journey. I would love to play along!